Faculty Development Program was conducted on 24th & 26th feb 2018,organized by ICEIT Student chapter & MTT-S of Department of Eletronics & Communication Engineering, GLBITM. This program was carried out in 3 different sessions. On 24th feb session was conducted on Next Generation Networks by Mr. Abhishek Gupta,Senior Division Engineer of ALTTC, Ghaziabad. During this session he disscused about comparative study of networks, installation of networks and its working environment in Telecom. 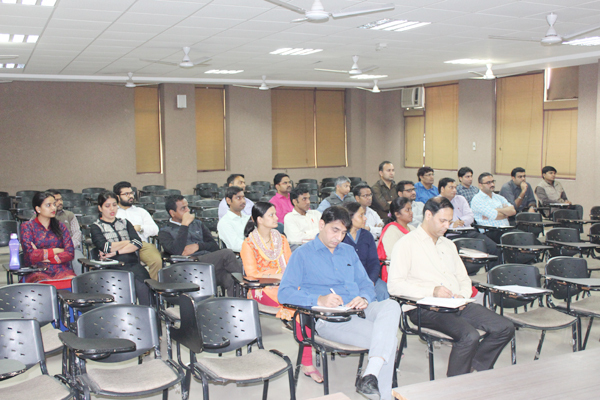 Second session was conducted in the mornging 26th feb 2018 by Dr. Satyendra Sharma ,HOD,ECE Department, GLBITM. He discussed about the Experimental appoarch for planning & designing a mobile netwoks, elaborated the session with the design aspects of antenna its application in defense and more areas. The last session was conducted in the afternoon 26th feb 2018 by Dr. A K Gautam,Professor,ICT Dept,Gautam budh university. He disscusted about the basics of Microstrip antenna & its applications. Circuit and logic design competition was organized by GLBITM-ICEIT STUDENT CHAPTER , Department of Electronics and Communication on 3rd March 2017 in which a total of 29 teams participated in both the competitions out of which 5 teams were from various other colleges as well. Students participated with full enthusiasm and good spirit. The competition took place in two stages in which first stage included the written objective test and the selected teams were allowed to participate in the second stage where they have to implement the circuit design practically. With a view to assimilate the profound wisdom of the eminent Academia and Industry leaders to flag major issues and to identify the directions for future growth, Industy-Academia convention aimed at fostering our ever improving relations with the industry. It focused on exploring research avenues between academic institutions and corporate organizations. The convention was addressed Mr. Ashok Marwah, Director Technology, Aricent Technologies, Mr. Shubhankar Ghose, Head-HR, ABP News Network Pvt. Ltd., Mr. Akhil Chaudhary, CEO< Binary Semantics. The Academia meet was endeavored to throw light on some of the indispensable skills necessary to thrive in a corporate expectations with technical education. In his opening remark Prof. Rajeev Agarwal, Director GLBITM informed that students have to adapt rapidly evolving technology along with a focus on practical and real-time industry problems which may not be inculcated merely by a theoretically sound education. Dr. H M Gupta, Professor Emeritus IIT Delhi, ICEIT Chair in his address at the inaugural function of the convention throwed some light on the theme of the event that industry-academia meet is a unique platform that will bring together experts from the industry to discuss the most critical issues about the gap in industry and academia today and explore the scope of direct involvement of industry for technical uplift of the students through training and projects. Exposure to real time industry applications and methodologies is required through direct interaction of industry and academia. An interactive panel discussion by industry leaders like Mr. P. K Dixit, Head HR, Autometers Alliance Ltd., Mr. Anup Gupta, Country Head, Customer Service, Autometers Alliance Ltd., Mr. Sumit Chakrovarty, Head, HR, Syscomm, Col S. Patnaik, Head Training, Tech-Mahindra, Mr. Ravikant, VP, Mothersosumi Infotech and Design Ltd. To discuss challenges faced by industry and academia as well as look for solution to any impediments that arise during the collaboration. Lecture series was delivered by the experts from industry and academia to discuss major high impact technologies and innovations prevalent in the industry. The takeaways from the convention were that the industry may provide pre-joining skill development program to aspiring or placed engineering students as per the industry needs and extend resources of the institute to design and develop test-bed, prototypes and working solutions in a cost effective manner. At the end of the session students interacted with industry professionals across multiple domains and share their thoughts for resolving technical issues through projects. Slide presentation competition was organized on 15th October 2016 by GLBITM, ICEIT Student chapter. Dr. H.M Gupta, Emeritus Professor, IIT Delhi was the chief Guest of the event who enlighten us with their kind words of wisdom. The program started with great enthusiasm and full participation of students from various other colleges like IIMT and G.L. BAJAJ itself. Students presented their ideas and thoughts about the topic and explained the role of electronics in development of smart cities with full enthusiasm and great confidence. Prizes were distributed to the top three presentations and were awarded with certificates. The objective of the symposium was to bring the students of various streams from institution on a common platform where they were encouraged to share knowledge and innovative ideas. It also aimed to exhibit the talents and skills of the aspiring Engineers both in Technical and Non-technical ways. Honorable Director, Dr. Rajeev Agarwal inaugurated the symposium by lightening the candle and made the students aware of the contribution of Dr. A.P.J. Abdul Kalam towards our nation as well as inspired them to do the same. The event was successful enough to attract as many as 350 registrations for various events being held under the great supervision of ICEIT Student’s Chapter Head, Piyush Yadav. G L Bajaj Institute of Technology and Management, Greater Noida and IEEE student branch took an initiative to celebrate the IEEE day on 03 Oct’2017 in the Institute. The event was organized by Department of Electronics and Communication Engineering. 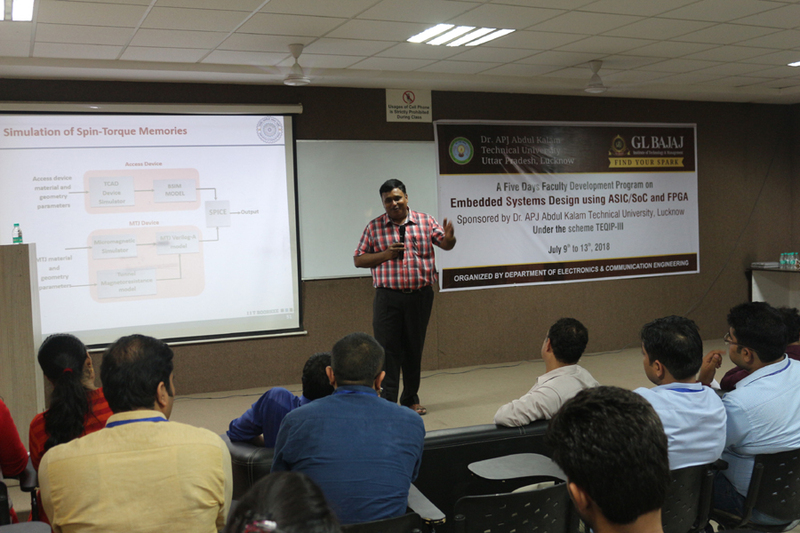 The objective of the event was to promote the IEEE aligned research, development and create awareness among students and faculty towards various IEEE initiatives. The inaugural ceremony of IEEE day celebration was conducted under the gracious presence of Dr. N.K. Sharma, Dean, GLBITM, Greater Noida, Dr. Jai Singh, Member IEEE, UP section, IEEE Student Branch Counselors, Faculties, IEEE Student members and other students. The event was inaugurated with lightening of lamp and views on IEEE from Dr. N.K. Sharma. He spoke about the importance of being professional member of IEEE, IEEE’s organization and leadership. IEEE Day Celebration was concluded by Dr. Jai Singh, Member IEEE, UP section. He gave the detail information of different societies of IEEE. He also guided the faculties and students regarding how to be benefitted by taking membership of different IEEE societies.